MONTGOMERY, AL – After the Biscuits took a combined no-hitter into the seventh, the Jacksonville Suns tied the game in the eighth then topped the Biscuits in the tenth by a final of 4-2 Tuesday at Riverwalk. Jake McGee tossed 4.2 innings of hitless baseball, with Jacksonville scoring once in the third on a two-out, Chris De La Cruz throwing error. Sergio Espinosa then held the Suns hitless through 2.1 innings. But with the Biscuits in front 2-1 in the eighth, Dane De La Rosa gave up the first Suns hit of the day – a double from Ryan Curry – then a game-tying single to Vinny Rottino. The Biscuits went down in order in the ninth, and the game went to extras. Rayner Oliveros (2-5) struck out Rottino to begin the tenth. Jason Delaney then singled and was replaced by pinch-runner Greg Burns. With Burns taking off for second, Mark Saccamanno then pulled a double down the left field line to score Burns and give the Suns their first lead at 3-2. Saccamanno advanced to third on a groundout, then scored on a wild pitch from Oliveros to make it 4-2. Matt Peterson (13) sat the Biscuits down in order in the tenth to preserve the win. Both Biscuits runs came in the second, Chris Nowak and Leslie Anderson knocked back-to-back doubles to begin the inning, then John Matulia scored Anderson with a single to give the Biscuits an early 2-0 lead. 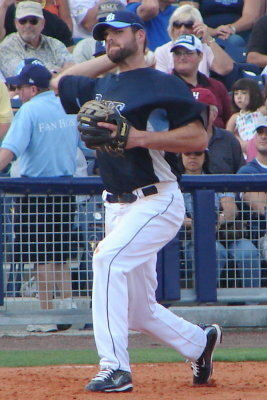 Dan Jennings (3-1) allowed one hit in two frames of relief to earn the win for the Suns. Chris Nowak led the Biscuits with a 3-4 night. The Biscuits are now 2.5 games behind Jacksonville – the same place they were when the series started on Saturday – with 11 games remaining in the first half. RHP Alex Cobb will throw for the Biscuits in the series capper on Wednesday at 7:05 against Jacksonville RHP Jeff Allison. Does anyone know how hard Mcgee is currently throwing? Reports at the beginning of the season, when he was getting hammered, had him at 90-92. My guess is his velocity is back, and thus the denomination of the competition.